Natural Dry Eye Treatment and Meibomian Gland Dysfunction protocol. Natural Dry Eye Treatment and Meibomian Gland Dysfunction by Dr Michael Lange 11/27/2014 Meibomian Gland Dysfunction and Dry Eye Treatment can be accomplished naturally without the use of any drugs or surgery. Dr Michael Lange of Lange Eye Care and The Lange Eye Institute has been using an all natural approach for this condition for over 20 years with huge success. Dr. Lange says if these steps are explained in detail to the patient and are followed carefully a vast improvement in dry eye and Meibomian gland dysfunction will be a result. Michael Lange OD, CNS is one of a select group of eye care providers that is a certified nutrition specialist as well. Dr. Lange is involved in the research and development of nutritional supplements for eye care and whole body wellness. 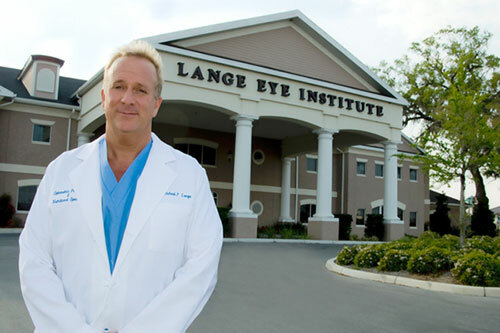 Dr Michael Lange founded Lange Eye care and Associates 3/15/1993 and has grown to 10 locations in Florida. The Lange Eye institute in the Villages Florida is one of the largest Nutrition oriented eye care centers in the country . The Lange Eye Institute is the home to many nutritional omega index studies, beta-carotene/lutein absorption studies and spectracell nutritional studies. Dr.Lange is constantly searching for better natural ways to help his patients. The Lange Eye Institute in The Villages Florida embraces the latest in nutritional, surgical, medical and optical treatments to help their patients. The following 6 steps will help doctors and patients in their quest to improve dry eye and Meibomian gland dysfunction. These six steps if followed will possibly eliminate even the dryest of eye conditions. The goal is to make the body work to its fullest potential. 1. Nutrition for dry eyes is the most important step in natural dry eye treatment. The majority of Americans are deficient in omega 3 with an Omega index score around 4 . Omega index is the ratio of omega 6 to omega 3 in blood. Omega index should be over 8 to gain the therapeutic health benefits. Take a good triglyceride form omega 3 fish oil with a minimum of 1500 mg of omega 3. The correct dosage of omega 3 will reduce inflammation in the Meibomian glands and improve the tear production. Most patients after taking the correct form omega 3 supplement in the right dosage will have a dramatic improvement in the tear production from the Meibomian glands. Fortifeye Super Omega gives the ratio of DHA and EPA that has been working in large dry eye clinics throughout the world. Omega index studies indicate that two per day dosing of Fortifeye Super Omega will bring the omega index to an average between 9.1 and 11 in patients under 240 lbs. The goal is to bring the omega index to a minimum of 8. People over 240 lbs may need to double the concentration of omega 3 to get the same results. Most patients with dry eyes and Meibomian gland dysfunction will improve by starting the correct form and dosage of omega 3 fish oil. However some moderate to marked dry eye symptoms may need some additional nutritional help. I recommend adding the most potent antioxidant /anti inflammatory nutrient on earth called astaxanthin at 6mg. Astaxanthin for dry eye is rapidly gaining a strong foothold in natural eye care. Astaxanthin is a super carotenoid derived from algae. Astaxanthin when added to omega 3 fish oil will enhance the anti inflammatory effects. Astaxanthin will also help to reduce dry tired eye symptoms. Astaxanthin has many other amazing health benefits. The combination of triglyceride form omega 3 fish oil and 6 mg of astaxanthin will help combat against oxidation and inflammation in the eye and entire body. This combination will also improve circulation to the eye and may indirectly help other eye problems like glaucoma, macular degeneration and diabetic retinopathy. One final nutrient that can be added for the more extreme dry eye is GLA from Black currant seed oil. I like a ratio of close to 10 to 1 GLA to omega 3. 140-160 mg of GLA in addition to 1400-1600 mg of omega 3 fish oil is ideal. 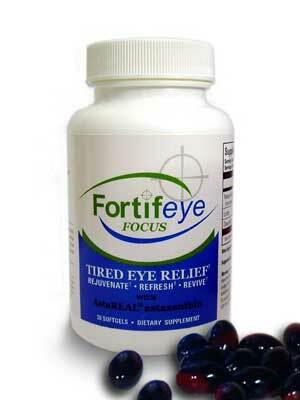 The exact combination can be obtained by taking two Fortifeye super omega along with 140 mg- 160 mg of GLA. GLA has some additional anti inflammatory properties that stimulate series 1 prostaglandins and aids in healthy tear production. 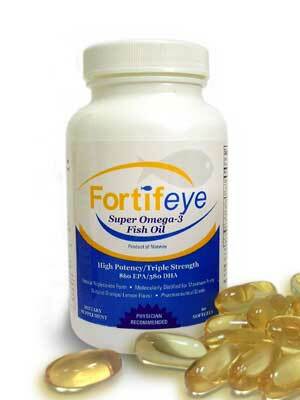 The triple whammy of dry eye nutrition is Triglyceride form omega 3 fish oil, Astaxanthin and GLA. There is a wonderful synergy between Omega 3, Astaxanthin and GLA. This combination of nutrients is also a power house formula for improving skin and joint health. Very new science is proving that the addition of very low dosage of aspirin ( 1/2 a baby aspirin full baby aspirin) taken at the same time as omega 3 fish oil may also work well together. The low dose aspirin potentiates the anti-inflammatory effects ( resolvin d3) of the omega 3. This is also being used in moderate to severe dry eye with positive success. Lowering inflammation is very important in the treatment of dry eyes. Dr Lange recommends patients to take the 1/2 baby aspirin with Fortifeye Super Omega at bedtime. Always discuss this with your primary care physician before initiating low dose aspirin therapy. 2. One of the main reasons for dry eye symptoms and Meibomian gland dysfunction is a build up of microbial flora on the eye lashes and inside the Meibomian glands. This condition is called blepharitis. If lids are quite inflamed ,red and crusty then proper lid hygiene is crucial as the first step at natural dry eye relief. I recommend scrubbing the lids and lid margins with a commercial preparation like occusoft lid scrub foam. This scrubbing will eliminate much of the bacterial flora on the lashes that can clog the Meibomian glands that secrete the crucial outer layer of the tear film. Often times if a patient has a chronic irritated red-eye even after doing lid scrubs with occusoft they may have another condition causing the problem, Another type of blepharitis is related to a small parasite called demodex. Demodex is a small parasite ( mite)that crawls into the hair follicle at night and lays eggs. These eggs will back up on the base of the lash causing a collarette to be seen by the optometrist or ophthalmologist with the bio microscope. The demodex may cause lids to become red, inflamed, crusty , and itch. 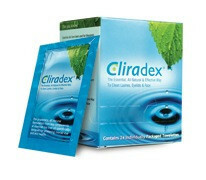 It is important to wipe the lashes and lid margins with a special pre medicated pad called cliradex right before bed. Cliradex has the demodex killing properties derived from tea tree oil and is extremely effective for the treatment of demodex related blepharitis and secondary dry eyes. Scrub lashes first with occusoft, rinse then rub the Cliradex onto lashes and lids before bed and do not rinse. This combination of lid hygiene will help to eliminate the microbial flora ( staph and demodex) that is blocking the Meibomian glands and causing the dry eyes. Proper lid hygiene is one of the most important steps in dry eye control and Meibomian gland dysfunction. 3. Meibomian glands often times need a jump-start to help them function to their fullest potential and secrete a healthy tear film. Massaging and heating the lid margins is necessary to unclog the Meibomian glands so these glands can secrete the outer lipid layer of tear film. This needs to be done for 10-15 minutes 2 times a day. The use of a warm wash cloth is an inexpensive way to accomplish this but Dr. Lange recommends using the Bruder Mask to heat up the Meibomian glands. This is a mask that is put in microwave for 20 seconds and then Velcro around your face for 10-15 minutes two times a day. 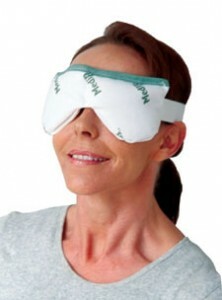 While the mask is on the eyes gently massage the lid margins to help un-block the blocked glands. This mask will also help cut inflammation surrounding the eyes. The Bruder eye hydrating mask can last 5-10 years without being replaced. This mask is only $25 and makes the hot compresses a very simple and relaxing task. 4. The use of good preservative free lubricating eye drops are important to use frequently in beginning phases of natural dry eye treatment. Artificial tears that have some hyaluranic acid for dry eye relief is Dr Langes first choice. Dr Lange recommends either Oasis tears plus or Blink to minimize dry eye symptomatology and both have hyaluronic acid in them . Hyaluaronic acid has some anti inflammatory effects and makes these two lubricating eye drops ideal for dry eyes. For the extreme dry eyes and Meibomian gland dysfunction the addition of a special lubricating eye drop called Retain MGD will add additional subjective relief. 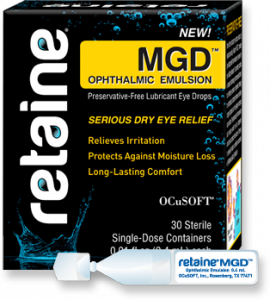 Retain MGD helps to replenish the outer lipid layer of tear film that may be deficient in Meibomian gland dysfunction . This combination helps to replenish all layers of the tear film.